As one of our students, you will be supported throughout your studies with modern and flexible learning facilities. Our School is housed in a single site at the heart of campus which has been designed to best meet the needs of our students. Here you will find light, open studios, versatile exhibition spaces, welcoming social areas, comfortable and well equipped seminar rooms, and a range of dedicated facilities which can be accessed 24 hours a day. digital and 3D printing facilities. Additional facilities are available nearby, including a 24 hour accessible computer suite. The School has a team of experienced technicians who can assist and advise our fine art students throughout their course. Within our building, we have seven light and spacious studios. As a fine art student at any level (BA, MA or PhD), you will be provided with space in one of our studios, according to your practice and needs. Each studio space has designated studio representatives and mentors. Because year groups are mixed in the studios, there is always a student nearby to support you when you embark on a new project. You are encouraged to regularly host open studio events, to help you to develop your curatorial practice. These provide great feedback from visitors and tutors which will help you to continue to think about how audiences encounter your work. If you decide to undertake a PhD with us, you will have access to one of our two large postgraduate research rooms. Each room is generously equipped with PCs, spacious desks and bookshelves, with access to a kitchen and seating area shared with academic staff. These dedicated rooms provide an excellent setting for working with your fellow PhD students and enhance the sense of a supportive postgraduate research community. They have created a welcoming environment for many conversations that have led to seminars and conferences run by our doctoral students. Our large Student Common Room sits at the heart of the School and offers a shared space for students across all our undergraduate and postgraduate courses. In addition to offering space to study, meet with other students or relax between classes, the Common Room is a regular venue for a wide range of student-led events and activities. These include film nights, games nights, fundraising events, exhibition openings, workshops and conferences. More information can be found at Student life. Our main exhibition venue is Project Space which hosts a curated programme of exhibitions, performances and workshops across the year. 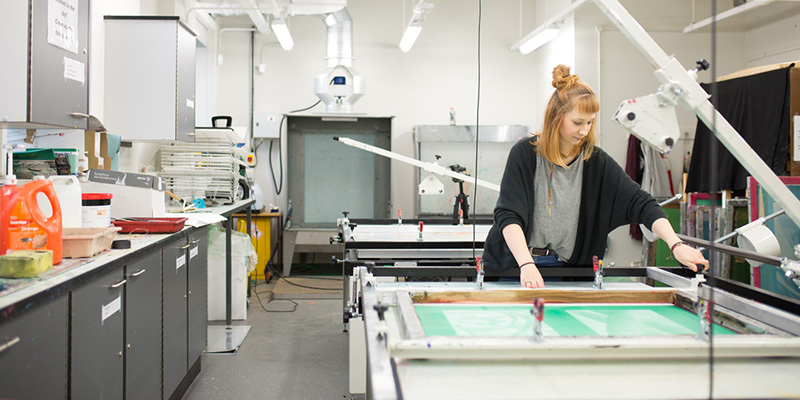 During the annual BA Fine Art and MA Fine Art Degree Shows, students regularly make use of the whole building, from Project Space and studios to corridors and the more hidden spaces which make up the fabric of the School. If you are a practice-led PhD student, you will have the option of making use of Project Space for your final exhibition. Find out more about Project Space. The School has three main teaching spaces where a lot of your classes will be. Some of these seminar rooms can also be used by student groups as venues for study groups, meetings and events. Leeds University Library is a world-class research library that invests around £5 million a year in developing its extensive printed and digital collections so that we can offer extensive resources to our students. The Library ranks as one of the best in the UK for the provision of electronic books, journals and databases, and has a wealth of manuscript, archive and early printed material in its Special Collections. Spread across four libraries, it is home to over 2.8 million books and journals. A range of different spaces for working either alone or in a group, along with generous opening hours, allow you to study in the way that best suits you. the Language Centre which offers a broad range of language training and preparation courses. Read more about academic facilities at the University of Leeds.